Two experts teach you how to "really cook" – in the kitchen and the courtroom. 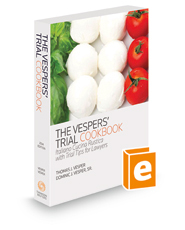 Follow Tom Vesper and cousin Dom in The Vespers' Trial Cookbook as they take you on a fun-filled, fact-filled, food-filled, instruction-filled journey to prove the unlikely axiom that good cooks and good trial lawyers share the same skills. All the while giving civil trial lawyers tips for success – from Dom in the kitchen and Tom in the courtroom. Tips for culinary and courtroom success are presented in a fun, educational, nontraditional style. Dividing a cooking menu and a lawyer's civil jury trial agenda into 12 parts each, Tom and cousin Dom have paired 12 tried-and-true litigation tips with corresponding tasty, rustica Italian recipes for delicious food and interesting libations, producing tasty and thought-provoking, educational analogs. Recipes for success in kitchen are paired with Tom's analogous “recipes” for trial lawyers to try – or try to avoid – at each stage of litigation, to increase the likelihood of courtroom success and to anchor retention.